During this year’s Kidney Week 2016 High Impact Clinical Trials session, we learned the results from 6 key studies. I’ll briefly take you through the results of each of them here. To start things off, Dr. Johannes Mann presented the secondary renal outcomes from the LEADER trial. You may remember from the July 28, 2016 NEJM article, that the primary outcome of the LEADER trial was to assess the cardiovascular effect of liraglutide, a GLP-1 analogue. This randomized, double-blind, placebo-controlled trial randomized over 9,000 patients to placebo or 1.8 mg (or the maximally tolerated dose) of liraglutide and found that the rate of the first occurrence of death from cardiovascular causes, nonfatal myocardial infarction, or nonfatal stroke was lower with liraglutide. Secondary renal outcomes included: new onset macroalbuminuria, persistent doubling of serum creatinine, ESRD, and death due to renal disease. At baseline, about 26% of patients had microalbuminuria, 10% had macroalbuminuria, and 23% had an eGFR <60. Throughout the study, A1c was reduced significantly more in the liraglutide group than the placebo group. Systolic blood pressure at month 36 was 1.2 mmHg lower in the liraglutide group but diastolic blood pressure was 0.6 mmHg higher in this group compared to placebo. Patients treated with liraglutide had a decreased risk of the composite renal outcome, a finding that was driven by reduction of new onset macroalbuminuria. Time to persistent doubling of creatinine, ESRD, and death due to renal disease was similar in both groups. There was a statistically but not clinically significant rate of decline in eGFR, which was driven by the subgroup of patients with CKD 3 at baseline. There was no difference in adverse events including acute renal failure in the two groups. Dr. Kristin Veighey shared the 5-year follow-up REPAIR trial, which assessed remote ischemic preconditioning (RIPC) in living kidney transplantation. They randomized 406 patients in a 2 x 2 factorial design study to one of 4 arms: 1) sham procedure, 2) early RIPC, 3) late RIPC, or 4) early and late RIPC. Early RIPC occurred immediately before surgery (also notably before anesthetics were started). Late RIPC was performed 24 hours before surgery. The original analysis published last year found that the GFR at 12 months was better but not significant in both early and late RIPC. Now, in their long term follow-up of these patients, they found that early RIPC led to an improved eGFR over 5 years. There was a similar trend in late RIPC but it was not statistically significant. Trends for graft lost and mortality over the 5 years appeared worse in the group randomized to the sham procedure but did not reach statistical significance. During questioning, Dr. Veighey hypothesized that the positive outcome seen in this trial (contrary to the result found in the RIPHeart study) was because in the REPAIR trial, RIPC occurred prior to anesthesia. RIPHeart study performed RIPC while the patient was under anesthesia. She concluded that as RIPC is safe and cheap, we should adopt it as routine care prior to living kidney transplantation based upon the results of this study. Dr. Christian Hugo presented results from the Harmony trial. Results were simultaneously released in The Lancet. 615 low immunological risk renal transplant recipients were randomized to low-dose tacrolimus, mycophenolate mofetil, and either 1) basiliximab induction and steroid maintenance therapy, 2) basiliximab induction with rapid corticosteroid withdrawal on day 8, or 3) rabbit ATG induction therapy and rapid corticosteroid withdrawal on day 8. The primary endpoint was the incidence of biopsy proven acute rejection at 12 months. There was no difference in biopsy proven acute rejection in the three arms of the study. Post transplant diabetes mellitus was significantly less in both rapid steroid withdrawal groups. Dr. Hugo noted that this is an important finding as other studies have shown that patients without post transplant diabetes mellitus have a slower worsening of their kidney function. Dr. Mark Marshall discussed results from the sodium lowering in dialysate (SoLid) trial. This study randomized 99 individuals on home hemodialysis to a dialysate sodium of 135mM versus 140mM (protocol). Primary outcome was left ventricular mass index by cardiac MRI at 12 months. Key exclusion criteria included patients with a pre-dialysis sodium less than 135mM, patients on maintenance hemodiafiltration, and patients that required more than 3.5 treatments a week. There was no treatment effect seen on the primary outcome of left ventricular mass. Most secondary outcomes are still being evaluated; however, they did see a significant decrease in intradialytic weight gain in the 135mM dialysate group. Full safety and tolerability results are still pending. Dr. Marshall concluded with his hypothesis that LV mass may be determined more by effects of uremia as opposed to those of fluid overload. Up next was Dr. Will Pendergraft presenting the results of the AURA-LV study. Patients with WHO class III, IV, and V lupus nephritis and labs consistent with highly active disease were randomized to placebo, low dose voclosporin, or high dose voclosporin on top of current standard of care treatment with oral corticosteroids and 2g/day of mycophenolate mofetil. Overall, 265 patients were randomized. The primary outcome was defined as achieving complete remission at 24 weeks which was defined as a composite of UPCR ≤ 0.5 mg/mg, eGFR >60ml/min or within 20% of baseline, steroid dose ≤ 10mg/day, and no use of rescue medications. Complete remission and partial remission was achieved significantly more in those treated with voclosporin compared with placebo. Complete remission was achieved by 32.6% in the low dose group, 27.3% in the high dose group, and 19.3% in the placebo group. There was no difference in renal function over time in any of the groups. There were more adverse events in those treated with voclosporin consistent with the increased immunosuppression. A phase 3 clinical trial is currently being designed to further assess the use of voclosporin in lupus nephritis. To conclude the session, Dr. Howard Trachtman discussed the preliminary results from the DUET trial. DUET is a phase 2 clinical trial that randomized patients with primary FSGS to 200 mg, 400 mg, or 800 mg of sparsentan, a dual angiotensin II and endothelin type A receptor antagonist, or 300 mg of irbesartan. Patients were treated for 8 weeks. This was followed by an open label extension where all patients were treated with sparsentan. The primary endpoint was the change in proteinuria at 8 weeks. Proteinuria was reduced significantly more in the sparsentan treated groups. In addition, 4 patients with sparsentan reached a complete remission at the end of 8 weeks, while no patient in the irbesartan group reached complete remission. Adverse events were similar in both groups and importantly, there was no worsening of edema during the double-blind period. Overall, it was an excellent session with a good mixture of positive and negative results. I look forward to seeing more from all of the studies presented! 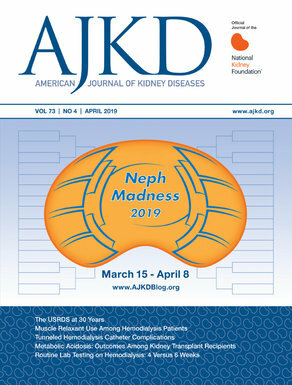 Check out more AJKD Blog coverage of Kidney Week 2016! I look forward for sparsentan in other disease like membranous nephropathy.